Dr. Rajan Chugh, MBBS, MS, DOMS, having illustrious experience of 22 years, is Senior Consultant - Ophthalmology at Fortis Hospital, Mohali. 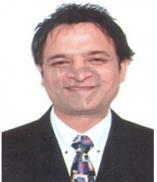 He have got trained and worked at reputed eye institutes in Ahmedabad, Bombay, Chennai, Delhi and Madurai. Dr. Rajan Chugh has accomplished his basic medical studies from the second oldest medical institute of Punjab, Government Medical College, Patiala. Thereafter, he pursued post graduation succeeded by a postgraduation Diploma in Ophthalmic Medicine & Surgery (DOMS) in Ophthalmology from the prestigious institute, PGIMER, Chandigarh. He has organized more than 100 Eye camps and has operated more than 25000 patients. He is also an expert in treating all other eye diseases and surgeries like Dry Eye, Corneal problems, Diabetic Retinopathy, Eye plastic surgery etc. To his credits, Dr.Chugh has designed many surgical micro instruments that have been helpful in making eye surgeries simpler. He has great experience in Phacoemulsification Cataract Micro-surgical techniques & Lasers and has developed a state-of-the-art operation theatre where the patients are up & moving immediately after the surgery, resume their normal activities immediately and need not wear goggles or take any precautions. Dr. Rajan Chugh had a distinguished academic career, including a university gold medal in Post Graduation. He has been honoured by various other awards such as, Medicos’ Medal, Medicos’ Trophy, University Gold Medal, Best Paper Awards, Best Ophthalmic Essay Award, National Jury Member, Baddi University. Furthermore, he has numerous Scientific publications in International & national journals and has delivered various orations & presented his research work at conferences.